You are currently browsing the Gluten Free For Good blog archives for June, 2010. Are you having an evolutionary flashback? 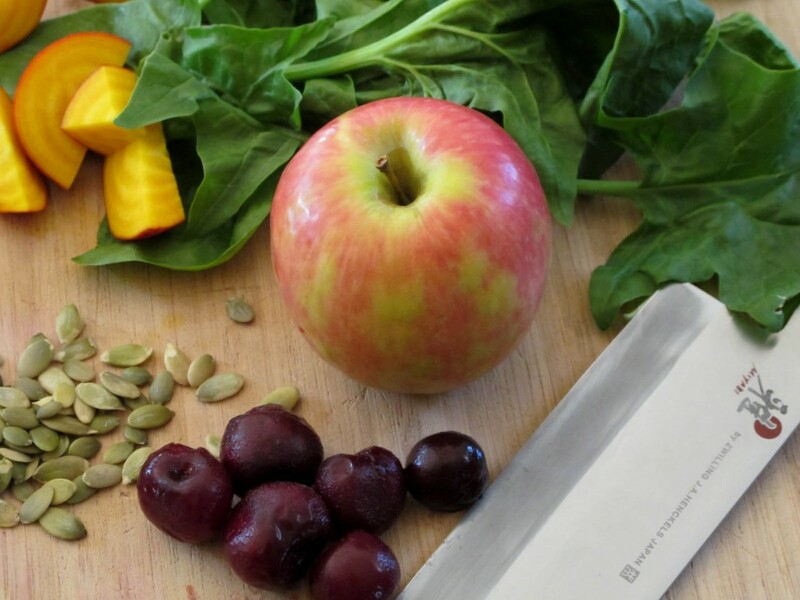 Belonging to a CSA means eating according to the natural, local growing cycles. Back in the olden days, this was the only option. No avocados if you lived in Colorado. No tomatoes in the winter unless you canned them. No spinach in December. Here in the Rocky Mountains, you can count on the possibility of snow into May (maybe longer), so June and July mean LOTS of greens (seriously, like a ton). 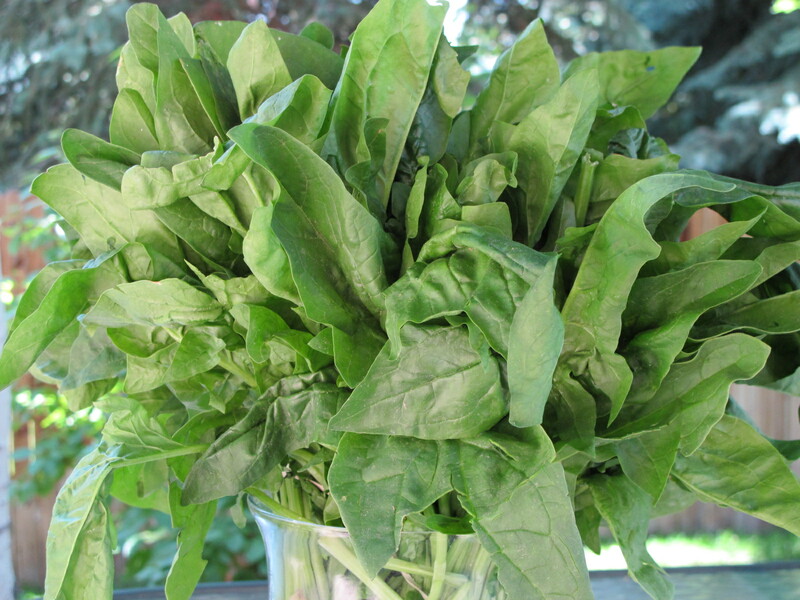 Right now my CSA share box is overflowing with spinach. My crisper drawer is jammed. I can’t shove another leaf into it. That’s the perceived downside to belonging to a CSA. No variety. Spinach, spinach and more spinach. Hey, we have too many options in life as it is, enjoy the simplicity. Sometimes less is more (or something like that). Just think “primitive diet” with a contemporary twist. Spinach is our main ingredient, we simply need to resort to some creative accessorizing. How about some maple syrup to sweeten things up? Those of you who have been following this blog for any length of time might recognize a pattern here. Pure, organic maple syrup is often my answer to life’s dilemmas. 1. Toast pecans in a small skillet over low heat until fragrant (3 to 5 minutes). Stir often. Transfer to a small bowl and set aside to cool. 2. Toss spinach and cucumber in a large bowl. 3. Heat oil in small skillet over low-medium heat. Add shallot and cook 4 to 5 minutes until softened. Stir often. Don’t let the shallot burn. Add vinegar and maple syrup and increase heat until almost boiling. Stir well. Season with salt and pepper. 4. Immediately pour the dressing over the spinach and cucumber. Toss well and sprinkle with cheese and toasted pecans. As for the abundance of CSA spinach, if all else fails, make a bouquet-ish arrangement out of it. See photo above. Go forth and eat spinach! Over and over. P.S. Cid, I’m counting on you to set me straight on my cheese choice. I’m guessing there’s a more fashionable accessory than smoked Gouda. Farm-fresh food lovers, start your engines (salad-spinners, blenders, stovetops, VitaMixes, ice-cream makers, juicers, dehydrators). CSA season is upon us! Okay, so we’re a little behind out here in Colorado. It’s that pesky snow thing. But, we’re a hardy bunch. We don’t let cold weather ruin our fun or our growing season. 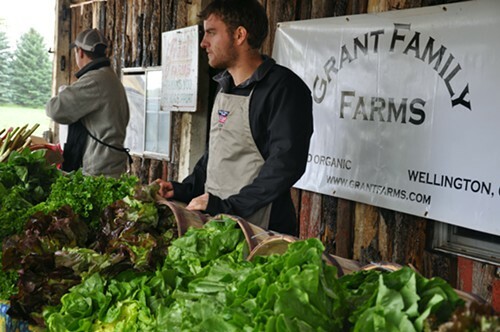 Last weekend was Grant Family Farm’s spring farm tour and CSA kick-off celebration. It was cold, rainy, dreary and muddy, but in true Woodstock tradition, spirits were high, the beer was flowing and the farm-fresh food abundant. As I did last year, I’ll be posting recipes according to what I receive in my share box each week. Please join me in eating our way through the season. Place all ingredient in a food processor and pulse. Salt and pepper to taste. Serving ideas: drizzle over roasted chicken, serve with crackers, use on pizza, substitute as a condiment in wraps or sandwiches, use as a pasta sauce. The possibilities are endless. Enjoy! Photos courtesy of Kirsten Akens, Food & Drink writer for the Colorado Springs Independent. 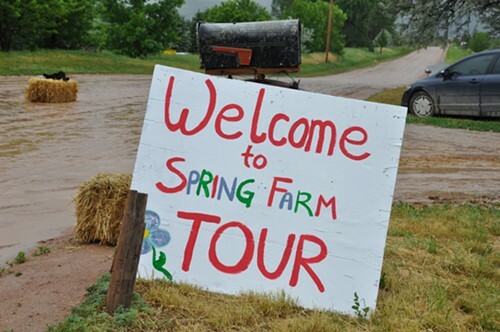 Please follow this link to Kirsten’s article about Grant Farms Spring Farm Tour (more photos included). Thank you, Kirsten! Peace, love and farm-fresh food. This was my lunch today and trust me, it was delicious. Actually, it was more like dinner masquerading as lunch. I have a weekend yoga workshop with Matthew Sanford that starts tonight, so I thought I’d reverse things and eat my big meal this afternoon. I just ate these tacos while watching Nadal make his way into the finals of the French Open. I think I’m evolving into a vegetarian. While I haven’t made it a definitive, 100% choice yet, I’m moving in that direction. I’ve never been much of a meat eater, so this all-veggie drift is natural for me. I don’t find it difficult to make up vegetarian versions of typical mainstream meals. In fact, it’s fun and entertaining. Plus, my Grant Farms CSA deliveries start soon, so farm-fresh, organic veggies will be abundant. Might as well start experimenting now. * I keep some homemade veggie broth or a container of Imagine vegetable broth in the fridge for oil-free sautéing and for adding moisture to mixtures like this. Place all the ingredients for the pico de gallo into a medium bowl. Mix well and let sit while making the tacos. Heat oven to 400 degrees. Place chopped sweet potato in a medium sized bowl. Drizzle with a small amount of olive oil (maybe 1 tablespoon at the most). Mix it up with your hands so the potato pieces are covered. Place on a lightly oiled cookie sheet, sprinkle with sea salt and place on middle shelf of the oven. Set timer for 15 minutes. Watch as they can burn quickly. Place chopped zucchini and broccoli in the bowl you used for the sweet potatoes. Add a touch of olive oil and toss to coat. After about 15 minutes or so (the potatoes should be half-done), shove the potatoes aside and add the broccoli and zucchini mix to the cookie sheet. Sprinkle with sea salt and return to oven for 10 to 15 more minutes. Keep an eye on it as the broccoli florets burn easily. Using a spatula, turn the veggies if needed. Remove from oven once they’re finished roasting. Heat a small amount of veggie broth (maybe 1/4th cup) in a large skillet. Add beans, roasted veggies, red pepper flakes and sea salt. Stir until well heated. You might need to add a touch more broth. You want it moist, but not drippy. While the mixture is heating, place the taco shells in the oven. It will only take a couple of minutes to heat them up. Watch carefully, they’ll burn quickly. Fill taco shells with veggie/bean mixture, sprinkle with shredded cheese, top with pico de gallo. Yum! Who says tacos have to be made with pork or beef? You might also like my kale taco recipe. Check here for details. 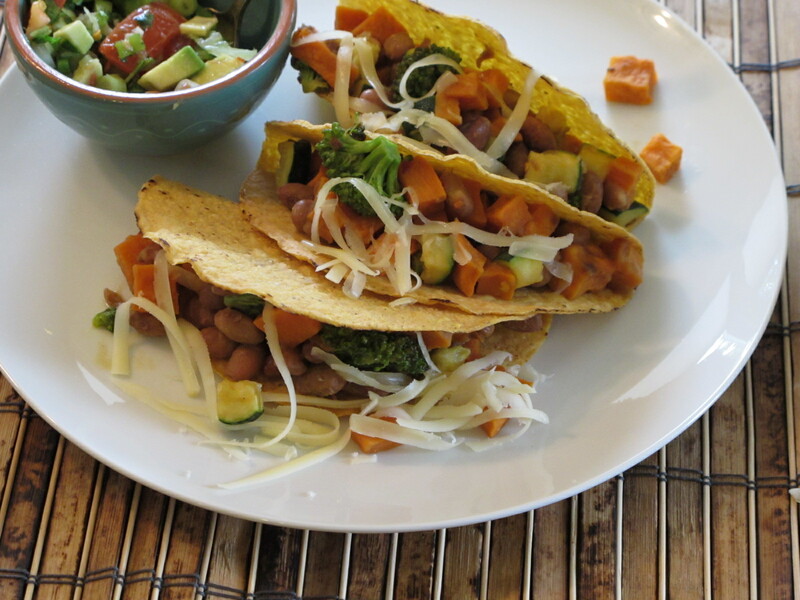 Peace, love and veggie tacos!